The word optimum in the title of this communication to my colleagues suggests two guidelines that I shall follow. First, the word implies that sociologists have a number of different ways to define the scope of the field and that some ways are better than others. It suggests, therefore, that I should strike an evaluative note in this essay. My account of sociology's scope should not be only inductive; it should be neither a distillation of definitions from textbooks, nor a recapitulation of the giants of the sociological tradition, nor a descriptive survey of what sociologists do. Rather, my account should explore critically the relations between what sociologists are doing and what they ought to be doing. I am confident that this evaluative emphasis is acceptable, since even those who insist that sociology be value-free acknowledge by that very insistence that we may relax the taboo on evaluation when we converse about the values and norms around which our inquiry should be organized. Second, optimum implies that we sociologists should conceive of ourselves as agents who proceed deliberately, if not always consciously, in creating the scope, limits, and divisions of our field, not merely as passive "discoverers" of an aspect of social life that is given in nature and remains only to be recorded and studied. I shall elaborate this implication later. The word scope also has two connotations, both of which I shall consider in this essay. The first connotation concerns the range of empirical subject matter of the field and the ways in which this subject matter is subdivided. The second connotation concerns the level of generality of propositions, models, and theories in sociology. At one extreme, the scope may be bound closely to identifiable data and limited in theoretical relevance; at the other extreme, the scope may be extended to abstract, comprehensive "grand theory"; or the scope may be pitched at some intermediate or "middle-range" level. It should be evident from these introductory remarks that my emphasis will be academic. I shall examine the discipline as a social science, mentioning its use in society and its applications to social policy only in passing. Sociologists frequently-though often implicitly-assume that their discipline, like other disciplines, covers a determinate range of empirical data. If this assumption were extended, the empirical world would be viewed as consisting of biological data (births, deaths, digestion, and elimination), psychological data (gratification and frustration of needs, expression of emotions), economic data (investments, purchases), and sociological data (interpersonal behavior in institutionalized roles). Following this kind of assumption, we would proceed to define the scope of sociology in an empirical way-that is, by identifying the appropriate range of data. Even cursory examination reveals, however, that such an assumption is not warranted. To illustrate its vulnerability, let us consider a single empirical datum-the act of a man purchasing tickets for four to Hawaii, where he plans to spend two weeks on vacation. Clearly this act has psychological significance, since the man has motives for purchasing the tickets and for choosing Hawaii as a vacation spot. In addition, the act has economic significance, since the individual is spending his funds for tickets rather than for other goods and services; moreover, his purchase, when aggregated with others, constitutes the economic demand for the airline industry. Finally, the act has sociological significance, in that the other three passengers are the purchaser's wife and children, and in that his purchase was preceded by a decision-making process within the family that led to the choice of Hawaii. The datum itself, then, can be a datum for at least three disciplines, and it cannot legitimately be limited to one discipline. From this, it must be concluded that sociology does not deal with a special class of empirical data; instead, it deals with data as interpreted within a special type of conceptual framework. Sociology and the other behavioral sciences arise from a common body of empirical data rather than several separate classes of data. With respect to characterizing the subject matter of sociology, then, I hold to the position that its subject matter is not in any natural way given in social reality but is the product of a selective identification of aspects of the empirical world for purposes of scientific description, classification, and explanation. Without a conceptual framework, it is not possible to identify ranges of empirical variation that are scientifically problematical. The first framework is found mainly in the special fields of demography and ecology. It involves the interpretation of events as aspects of human organisms considered in their physical and biological environments and in relation to the coordinates of space and time, without reference in the first instance either to the psychological systems or to the social relations of the organisms. The preoccupation of demography and ecology is to explain regularities and variations in the size and composition of human populations, as well as regularities and variations in births, deaths, physical movements, and spatial arrangements. To be sure, investigators in these fields frequently have recourse to psychological and social variables in attempting to explain these regularities and variations. But at the present time, I am considering the subject matter only as the phenomena to be explained. The second framework is found mainly in the long-standing (if still sprawling and indefinite) special field of social psychology. It involves the interpretation of behavior in terms of its psychological significance to the individual considered as self or person. Stated another way, the conceptual framework used to organize the study of behavior is the psychological system of the human being-for example, his motives, his attitudes, his cognitions, his skills, and his sense of identity. This framework is the focus of psychology, but it also has a solid place in academic sociology. These two frameworks focus on the individual person, either in his significance as a biological organism or in his significance as a psychological system. A third framework-that which concerns the group-arises when we consider numbers of individual persons who become aggregated, more or less purposively, as members of a collectivity with some common orientation or orientations. When sociologists refer to primary groups, voluntary associations, or class groupings, for example, they usually think of them as being made up of numbers of persons considered as members. Sometimes sociologists study social groups as units in their own right, interacting with one another without reference to their individual members-as in the case of competition among political parties, conflict among racial groups, or status-striving among cliques. A fourth and quite different perspective emerges when social life is considered, not from the vantage point of the persons involved, but rather from the vantage point of the relations between persons. The familiar concept of "role" characterizes these relations-the roles of husband and wife, politician and voter, employer and employee, businessman and consumer. The concept of person and the concept of role are analytically separate, even though both are based ultimately on a common body of behavioral data. The two concepts cut across one another. A person occupies many different roles; and a role cannot refer to a complete person but only to selected aspects of his behavior. The equally familiar concept of social structure refers to identifiable patterns of roles that are organized primarily around the fulfillment of some social function or activity-for example, religious structure, educational structure, or political structure. The concepts of group and social structure, then, refer to different aspects of social data. Or, to emphasize the conceptual aspects, they are different ways of looking at social data. Furthermore, the same behavioral phenomena can be legitimately characterized according to both aspects. For example, a trade union can be described both as a group with individual members and as a system of interrelated roles-officers, shop stewards, representatives of locals, and the like. In the present state of sociology, both group analysis and structural analysis are widely employed; but it has not yet been settled whether either, both, or neither is the best basis for organizing sociological knowledge. The fifth framework concerns a variety of cultural phenomena that regulate, legitimize, and lend meaning to all social behavior-whether this behavior be conceptualized according to the "person," "group," or "structural" perspectives. Norms, for example, are standards that regulate the interaction among persons and groups; values are standards that provide legitimacy for social arrangements and social behavior; ideologies and cosmologies provide a context within which values and norms are grounded in meaning. As a first approximation, then, we may affirm that the scope of the subject matter of sociology is found in the several conceptual frameworks I have sketched. The sociological enterprise is to account for regularities, variations, and interdependencies among the phenomena that constitute these frameworks. By way of qualification, I should add that these several frameworks are not always neatly set off from one another conceptually, that in many studies the investigator operates within more than one of the frameworks, and that, occasionally, a sociologist may venture into still other conceptual territories than those mentioned. This view of the conceptual scope of sociology yields evidence for a conclusion that many of us share-that sociology, by comparison with some other sciences, lacks a single conceptual framework. The field is difficult to distinguish from others because it contains a diversity of frameworks, some of which it shares with other fields such as psychology and anthropology. If anything, then, sociology is too comprehensive, diffuse, soft in the center, and fuzzy around the edges. These qualities make for a field that is enormously complex and engaging but less scientifically adequate than might be optimal. It follows that if sociology continues its movement toward scientific maturity, it must be expected that it will shed certain aspects of these frameworks and consolidate others. This is a natural consequence of the development of a specialized field of knowledge from a more diffuse tradition of thought. Unsettling as it may be for those of us who like sociology as we know and practice it, this prospect seems to be in the historical cards. After all, sociology has already had a history of severing some of its connections with social philosophy, social policy, and social ideology-connections that are far from completely severed in the mid-twentieth century (Lipset and Smelser 1961). It also appears that some special subfields of sociology, such as demography, may now be heading toward separate disciplinary status, if we take as evidence the consolidation of a theoretical framework, the growth of a specialized literature, the growth of a separate professional association, and the establishment of separate programs, and even departments, in institutions of higher learning. The future relations between the various social psychological perspectives-such as symbolic interactionism, social behaviorism, and the new "ethnomethodology"-and the other frameworks of sociology seem uncertain: some may be assimilated in modified form to other disciplines; others may remain attached in modified form as parts of a discipline oriented primarily to the "group" and "social structural" perspectives; and still others may become specialties on their own. Despite some uncertainty about the precise lines of future development, it seems evident that future generations will know many sociologies and will view the work of our own generation as hopelessly broad in its sociological preoccupations. It may be correct to view the growth of sociology as the spinning off of some frameworks and the consolidation of those that remain. But I do not view this pattern of growth, considered alone, as optimal. The growth of new specialties, however scientifically adequate they may be, always raises new questions about their relations with other bodies of knowledge. More specialization will aggravate the already pressing problem of the insulation of the various branches of the behavioral sciences from one another. Optimally, a new pattern of integrating knowledge should arise simultaneously, a pattern whereby the implications of one discipline or subdiscipline for the work of others become a subject of disciplined inquiry in itself. Even in the present state of specialization of the behavioral sciences too little is known of the potentially profitable interchanges among the various disciplines [see chapter 2-NS]. As knowledge becomes more specialized, the need for new synthesis and coordination will become even greater. Without the growth-indeed the specialization-of intellectually synthesizing activities, it will become more likely that scientific specialties will tend to paint themselves into corners, exhausting their potentialities through excessive refinement rather than opening their assumptions to the theories and research of neighboring zones of inquiry. I would hope, then, that two processes will dominate the future growth of sociology-the inevitable fragmentation and consolidation into more specialties, and the intellectual coordination of these specialties on a new level of interdisciplinary integration. I shall conclude this discussion of conceptual frameworks in sociology with a brief comment on some of the intellectual controversies within the discipline. Many of these derive in part from the fact that some sociologists have committed themselves to one framework or another and have assumed a more or less polemic stance as regards its value for sociology as a whole. Ready examples could be provided for frameworks like the ecological, the psychological, and the structural-functional (see Duncan and Schnore 1959; Homans 1964; Merton 1957). But I should also like to mention another controversy-perhaps the most widespread one in the field at the present time-in this context of commitment to different conceptual frameworks. I refer to the continuing and multifaceted controversy between those who tend to stress conflict and change in their approach and those who tend to stress integration and stability. The first position has historical roots in figures like Karl Marx and Georg Simmel, and its contemporary representatives are figures like Lewis Coser and Ralf Dahrendorf; the second position has historical roots in figures like Émile Durkheim and A. R. Radcliffe Brown and is most conspicuously identified with the name of Talcott Parsons at the present time. Many read this controversy in almost completely ideological terms-that is, in terms of whether the theorist is assuming a radical or a conservative stance toward the status quo. This interpretation may have some merit. But I should like to add that to identify the respective conceptual frameworks adopted by the representatives also contributes to an understanding of the roots of the controversy. One of the differences between these loosely defined approaches is that the "conflict and change" approach tends to rely more on the "person" or "group" perspective and the "integration and stability" approach tends to rely more on the "social structural" or "cultural" framework. Because of an initial emphasis on different frameworks, the two types of theorists become more capable of, and more disposed to, analysis of situations of instability and stability, respectively. Indeed it is individuals and groups that come into conflict, not relational qualities such as structures; it is persons and groups that have clashing interests, not roles and structures; and concepts like roles and normative expectations, by their very logic, refer to the ways in which persons and groups routinely-and in a regulated way-interact with one another. To generalize this observation, commitment to a given conceptual framework tends to focus the attention of the social investigator on certain types of topics and scientific problems. Talcott Parsons has made a pertinent observation on this issue in a discussion of dynamics in sociology: "Dynamic analysis is . . . not possible in terms of the systematic treatment of institutional structure alone. [It] involves the possibility of generalized treatment of behavioral tendencies of the human actors, in situations in which they are placed and subject to the expectations of their institutionalized roles. In the most general terms such generalization depends on a theory of 'motivation' of human behavior. The ultimate foundations of such a theory must certainly be derived from the science of psychology" (1954, 233). I would add only that a theory of dynamics must be derived from a theory of group action as well as a theory of personality. In this connection, it is interesting to note that in the thought of Karl Marx the forces that make for integration and resistance to social change are found in the relations among the various elements of the economic structure and the superstructure (for example, the temporarily stabilizing influences of law, religion, and the state during any given historical period); and the forces that make for conflict and change are found in groups of motivated individuals (class-conscious organizations, revolutionary parties). The relational structure provides the historical contradictions that give rise to conflict and change, but political groups actually enter into conflict and effect processes of change. Marx, in short, used both the "structural" and the "group" perspectives, depending on the issue he was addressing. The conclusion I draw from these various observations is that future advances in the study of social change depend, in part, on the attainment of a more profitable synthesis of these two perspectives than we have been able to effect in the past. 1. Some subfields correspond more or less to the major conceptual frameworks listed above-for example, demography, social psychology, social organization, and sociology of culture. 2. Additional subfields arise when the major conceptual frameworks are subdivided by empirical illustration. For example, in the "group" framework we find the sociology of small groups, voluntary associations, formal organizations, and so on. Within the "structural" framework we find structures identified according to type of function-sociology of religion, medicine, law, medicine, and so on. Within the "cultural" framework we find the sociology of literature, knowledge, popular culture, and the like. 3. Some subfields arise when investigators focus on some relations between the major conceptual frameworks. The focus of the subfield of socialization and personality, for instance, is the relations between the sociocultural structure and the formation of individual personalities; the subfield of deviance and social control refers to the same relations, studied from the standpoint of degree of conformity to the sociocultural structure. 4. Still other subfields refer to analytic aspects of social life that cut across the frameworks listed above. Stratification, for example, refers to the study of the hierarchical organization of roles, persons, and groups in social life; and political sociology refers to the generation, allocation, and utilization of power in social life. 5. Some subfields refer to a process, such as collective behavior or the sociology of economic development. 6. A few subfields refer to the logic and techniques of conceptualization and empirical research-for example, theory and methodology. 7. Finally, some subfields arise as a result of sociology's historical tendency to focus on social problems that are pressing in the larger society-for example, the sociology of prostitution, mental illness, or poverty. Since all these criteria of classification are used-and each is used incompletely-in the internal division of sociology, the contemporary scene yields a bewildering patchwork of fields that is anything but scientifically optimal. Furthermore, it seems reasonable to expect that two shifts in the bases of classification will accompany the increasing scientific maturation of the field. First, while sociology will undoubtedly continue to be called upon to address itself to society's moral, political, and social problems, its approach to them will be, not to create subfields around specific types of problems, but rather to bring understanding to these problems from more general principles of social structure and group processes. Consider an analogy. Economics does not have subfields of "inflation" or "depression"; rather, it throws light on these phenomena by applying more general principles from the theories of consumption, production, and price. Similarly, insights on delinquency, civil disorder, and other social problems will, in the future, come not from concrete subfields of sociology named after these problems but from general knowledge concerning processes of deviance and social control. Indeed, sociology shows some signs that this kind of change has already occurred to a degree, as courses in principles of deviance have come to displace courses organized around a variety of "social problems" in many educational institutions. Second-and related to the first point-the naming of subdivisions after specific groups and social structures will probably give way to more general characterizations of structures and processes. The main reason for this is that subdivisions identified with particular historical circumstances inhibit the development of a discipline with truly general principles. The subfield of race relations, for example, seems to be a very appropriate one for societies like the United States, South Africa, and Indonesia, where racial groupings play a salient role; but it does not seem to apply readily to racially and ethnically homogeneous societies. Again, the sociology of law seems to be an appropriate subfield for societies like ours, where law is such an important social institution; but, for societies governed largely by unwritten mores, the sociology of law has little relevance. A more general, analytic characterization, such as social control, would be preferable, since it encompasses both legal and nonlegal types of social regulation. The upshot of these observations is that sociological subdivisions will probably evolve toward fewer, more analytic areas concerning basic structures and processes and that this is desirable in the interests of developing a science that is genuinely theoretical and broadly comparative. But this kind of development will not occur without creating serious dilemmas for the discipline. I have been arguing for sociological subdivisions that are not tied to particular social problems or to concrete groups or structures. But it remains the case that most of the sociological data with which we must deal are recorded by, and refer to, concrete social units, such as societies, communities, formal organizations, and individual persons. Governments conduct censuses, municipal or county agencies record most suicide and crime statistics, business firms keep records, and so on. Moreover, these units tend to emit, collect, and record more data about problems that preoccupy them in any given historical period. Because such units are the source of much of our necessary data, it is tempting to use them as the basis of our sociological frameworks. In comparative sociology, for example, most comparisons are made among national or social units. In one way this makes sense, since most aggregated comparative data are generated by societies. But for many purposes "the society" may not be the best comparative unit. We may wish to organize our study around the comparison of regions with different religions, different languages, or different ethnic solidarities. Yet these kinds of regions scarcely produce data suitable for comparative analysis. These circumstances imply that the conceptual framework that the sociological investigator may wish to use to generate insights may lie on a different analytic level from the sociocultural contexts in which his available data have been generated. Further, the more analytic his categories, the more remote they are likely to be from these contexts. The lesson to be learned from this dilemma, however, is not that sociology should restrict itself to concepts that correspond to the context within which social data are available. To argue this would be to argue for a sociology as concrete as the social units that produce the data on which it relies. Rather, the lesson is that sociologists must expect to be preoccupied with methodology-defined broadly as the canons by which theoretically relevant scientific statements are assessed in the light of empirical data. As sociological concepts become more comprehensive, new methods for relating these concepts to social data must be invented. It is sometimes asserted that a preoccupation with methodology signifies an immature scientific discipline in search of itself and that this preoccupation will fade away as the science advances. I do not share this view. The peculiar relation between analytic concepts and much of the data with which the discipline deals suggests that new levels of methodological concern must arise as the field becomes theoretically and empirically more sophisticated. Thus far, I have attempted to delineate the optimum scope and optimum subdivisions of sociology, indicating at the same time some problems and dilemmas that arise in striving for these optima. The second connotation of scope to which I wish to address myself refers to the kinds of activities that go into sociological explanation-that enterprise of accounting for the regularities, variations, and interdependencies among the phenomena identified within the sociological frameworks. What should be the scope of these activities? At what level should they be pitched? Frequently, two alternative strategies are debated: either to investigate relatively modest hypotheses that remain close to the empirical data or to deal with more comprehensive and abstract "theory" that is more remote from data. I shall argue, however, that this distinction is not the best way to frame the issue of the appropriate scope of sociological explanation; and, simultaneously, I hope to formulate a somewhat different "principle of legitimacy" that should govern the various activities that enter into sociological explanation. The several sociological frameworks outlined earlier were advanced as ways to characterize the major dependent variables of the discipline-those phenomena, variations in which are to be explained. Explanation itself, however, begins with the search for independent variables (or causes, or determinants, or factors, or conditions) to which variations in the dependent variables are referred. What are the independent variables most frequently used by sociologists to explain variations in social phenomena? By and large, sociologists find their explanatory variables by turning to those very phenomena that, in other contexts, they may wish to explain. Variations in demographic behavior, such as fertility, are frequently explained by reference to attitudes, group members, positions in the social structure, or differential exposure to cultural values (for instance, religion). Similarly, variations in attitudes are frequently explained by turning to group, social structural, and cultural variables. Certain types of social structures (for example, the isolated nuclear family) have been accounted for by referring to other structural variables (for example, industrial bureaucracy); the persistence of extended family traditions in spite of industrialization is often attributed to distinctive cultural traditions. Again, cultural productions such as art forms or ideologies are often accounted for by referring to conditions obtaining in different parts of the social structure. Sociological explanation, then, looks to variables within the same or neighboring frameworks to account for variations. The form of sociological explanation that appears least complicated is the simple hypothesis-a statement of the logically, and presumably temporally, prior conditions under which dependent variables may be expected to vary in certain ways. Two simple examples of sociological hypotheses are the following: (1) the size of the nuclear family is an inverse function of position in the stratification system, and (2) the level of social violence of any group is a direct function of its level of economic deprivation. In the first case, one structural variable is explained by reference to another structural variable; in the second case, a certain type of behavior is explained by simultaneous reference to group membership and the group's position in the social structure. Closer examination reveals, however, that even simple hypotheses of this sort involve a number of ancillary assertions, assumptions, and perspectives. Consider the second illustration from the preceding paragraph. If taken without qualification, the hypothesis implies that economic deprivation, measured by some objective criterion, has a direct effect on a group and its members. This assertion is questionable on psychological grounds, since different groups have different levels of susceptibility to economic hardship, depending on their cultural values and historical experience; and, within any group, individuals bring different meanings to economic deprivation and have different thresholds of tolerance for it. Furthermore, the hypothesis implies a number of psychological variables-affects (such as rage) and processes by which these affects are converted into action-that intervene between the independent and dependent variables. Finally, the sociological investigator frequently finds the empirical relation between variables like deprivation and violence to be weak; and he wishes to refine that hypothesis by considering additional determinants of violence that may interact with deprivation, as well as additional responses to deprivation other than violence. For all these reasons, it turns out that a relatively simple and innocent hypothesis invariably involves a whole family of statements that stand in some implicit but relatively determinate relation to one another. Put another way, any single hypothesis is nestled in a system of hypotheses. Put still another way, any hypothesis implies a more complex model or theory of behavior. Furthermore, the roots of this model are to be found, once again, in the various frameworks-ecological, psychological, group, structural, and cultural-that constitute the substance of sociology. If this is the case, what is the distinctive character of model building or theory construction itself? This process often involves a number of activities, but as a first approximation it might be said that it consists in making explicit the variables and relations that are often only implicit in simple hypotheses, and in setting these ingredients into some formal or logical-including mathematical-relation with one another. Taking a hypothesis as the initial point of reference, the specialist in empirical research looks in the direction of the world of facts and proceeds according to the logic of locating, measuring, and recording data; ensuring the reliability and representativeness of these data; and controlling for the operation of other possible independent variables by experimental, statistical, or other research techniques. The theorist looks in the direction of the world of concepts. He examines the conceptual rather than the empirical context of the hypothesis. He attends to such matters as the mutual exclusiveness and logical exhaustiveness of classes of variables and relations; the internal consistency of hypotheses, and their consistency with other bodies of knowledge; their economy of expression; and their power, when combined with other assumptions and assertions, to generate new hypotheses. By this characterization, I do not mean to personify the specialist in empirical research and the specialist in theory as separate breeds. The same investigator frequently attends to both empirical and theoretical issues. But the classes of activity are distinguishable from each other. From this characterization, it becomes clear that sociological theory borders very closely on logic and epistemology, as well as moral and political philosophy. Any sociological theory rests on definite epistemological foundations-indeed, my own presentation of the nature of a sociological fact and the character of sociological explanation belies a definite epistemological position. Furthermore, because the substance of sociology involves, above all, formulations of general assertions of man's relation to man, it overlaps with religious, moral and political doctrines that focus on the very same classes of relations. One of the most common exercises in theoretical analysis is to relate the thought of a theorist to some ideological position or to some school of moral and political philosophy. In fact, some of the most heated controversies in sociology concern the ideological or philosophical foundations of a theory rather than the explanatory utility of a theory. Before moving on, I should like to digress briefly to examine a distinction employed in the preceding paragraphs-the distinction between theory and fact. In one form or another, this distinction is almost universally accepted by social and behavioral scientists. According to the distinction, the world may be divided into empirical facts (behavioral data) that are given in the "real world" and theories (concepts, constructs, models) that are in the "world of ideas"; and the core task of scientific inquiry consists in systematically generating explanations by bringing theory and fact into some appropriate relation with one another. I should like to raise some questions about this form of the distinction. In a classic statement, Lawrence J. Henderson defined a fact as "an empirically verifiable statement about phenomena in terms of a conceptual scheme" (quoted in Parsons 1937, 41). The important phrase for present purposes is "in terms of a conceptual scheme." I argued above that there is no such entity as a "sociological fact" apart from the conceptual framework to which it is referred. Even such an apparently real and irreducible datum as the birth of a child or a market transaction depends on the selective identification of aspects of empirical phenomena; notions of instance and class; and grammatical conventions-in short, a conceptual framework that serves to select from, identify, and organize experience. When we refer to facts or behavioral data, then, we actually refer to a universe of statements, the rules for organizing which are commonly rooted in the unexamined structures of common language and common sense. There cannot be a fact without a conceptual framework. As I have indicated, sociological explanation consists in bringing constructions such as hypotheses, models, and theories to bear on factual statements. But in what do these constructions consist? They are also conceptual frameworks. They are composed of concepts that are related to one another by a certain logic, or rules of discourse that are usually more precise and rigorous than those governing the use of common language. Accordingly, sociological explanation has to be defined not as the relation between two different classes of things-theories and facts-but as a relation between two conceptual frameworks. It consists in comparing the linguistic and conceptual conventions by which we organize the phenomena that we call the empirical world with the linguistic and conceptual conventions by which we organize the phenomena that we call ideas. If a certain relation between the two frameworks is attained, we judge an assertion to be "valid" or "verified"; if another relation is attained, we judge the assertion to be "rejected" or "in need of modification." This formulation constitutes a kind of correspondence theory of scientific truth, but the correspondence is between different kinds of conceptual frameworks rather than between conceptual frameworks and facts. This kind of conclusion is somewhat disturbing to those of us who like to think of a "real world" that is separate from our ideas about it; but it is more in keeping with the ways in which experience is organized and scientific investigation proceeds. This formulation underscores the principle that scientific innovation may arise from two principal sources. First, it may arise from a modification of the conceptual framework by which we regard the "factual world." This may involve a new way of conceptualizing a fact (a "discovery"), a new way of measuring it, a new way of bringing it into relation with another fact. This change may then disturb a previous "correspondence" with an explanatory or theoretical framework and lead to modification of this framework and its relation with the framework by which we organize the "factual world." Second, scientific innovation may arise by virtue of a modification of the relations among the theoretical constructs themselves, which may suggest new ways of looking at facts, which, in turn, may generate new methods of organizing facts to correspond with the new theoretical relations. Scientific advance consists in a continuous feedback between these two ways of organizing experience. The history of social thought has witnessed the appearance and disappearance of many epistemological positions, each of which has advanced and defended a principle by which knowledge concerning human affairs can best be generated. Among these approaches are rationalism, positivism, and intuitionism. In the shorter history of the scientific investigation of social life, too, certain methods have been selected as favorite candidates in the race to advance scientific knowledge-for example, the experimental method, quantification, and clinical observation. Each of these approaches or methods possesses the characteristics of a value system, in that proponents of each have attempted to set up criteria to legitimize the scope and method of social inquiry. Unfortunately, they have manifested another feature of value systems as well-the tendency to harden into doctrinal schools, which form the bases on which cadres of scholars spend much of their energy in combating other scholars about the relative legitimacy of their respective approaches to knowledge. These conflicts are probably inevitable features of the human condition and will remain with us as long as we continue the effort to design the discipline. But the tendency to form schools around epistemological positions does exact a cost: it discourages the dispassionate examination of the synthetic relations that might obtain among the different approaches and methods. The version of sociological explanation that I have sketched-which is generally consistent with the method of empirical science that has evolved during the past centuries-is also a value position. As such, it attempts to sketch the broad lines of legitimacy for a variety of sociological activities. Moreover, this version of sociological explanation envisions no single, royal road to scientific knowledge about society. It does not give any special priority to the quantification of data, speculation, or the creation of theory at a given level of abstraction. It legitimizes a wide range of activities-recording data, designing measures, setting up experiments, analyzing data, classifying variables and relations, deducing hypotheses, speculating freely, and tracing the moral and ideological implications of a theoretical system. All can contribute-indeed, all are essential-to the sociological enterprise. Such a catholic approach appears to have the merit of being inclusive, tolerant, and nonpolemic. By virtue of these merits, however, it seems also to lose its power of legitimizing. To legitimize so much is almost to legitimize nothing, since it appears that "anything goes" in sociology. The approach I have sketched seems to run the danger of intellectual anomie, bred by an excess of permissiveness. 1. A small-group experiment may be flawlessly designed, but it is without sociological merit unless it can be brought to bear in some way-by confirming, rejecting, suggesting modification, and so on-on theoretically relevant statements within a sociological framework. 2. A field study may be extraordinarily rich and interesting in its anecdotal material, but if the material is not related to some theoretically relevant proposition it has no sociological merit. 4. A new hypothesis may be elegantly derived from a complex set of mathematical relations-or even produced by a computer-but unless the mathematics can be related to substantive sociological theory, and unless the hypothesis can be related to sociological data, it has no sociological merit. 5. The discovery of a valid comparative association between institutional complexes-say, authority systems and division of labor-may be impressive; but unless it can be incorporated into a system of sociological hypotheses, it is of no sociological utility. 6. A scholarly treatise tracing the history of the concept of social cohesion may be informative and engaging, but unless the work is related to the current sociological enterprise of theory and research it is of no sociological value. 7. A critical examination of a theorist's system, which demonstrates convincingly that he falls into the neo-Marxist tradition or that he has a conservative bias, may be both scholarly and gratifying on ideological grounds, but unless it can assist in the evaluation of some theoretical scheme or empirical research it has no sociological merit. In short, the use of adjectives like flawless, rich, ingenious, rigorous, elegant, or interesting falls short of endowing sociological work with full legitimacy; the work must also be related to the central sociological enterprise-either by the perpetrator of the work or by someone else-before it can be said to constitute a contribution. This assertion requires one major qualification, however. Although I am convinced that the criterion is optimal for the growth of scientific sociology, it can be applied in only an approximate way. The reason for this is that the sociological frameworks and research procedures themselves are not completely final and fixed. They are in a continuous state of flux, and much disagreement obtains in the profession about the core of sociology itself. I see the application of the criterion of sociological legitimacy, then, as something not definitive. I see its application as part of the ongoing search of sociology, as a general guideline in the continuing evolution of the discipline. To conclude, the two criteria of legitimacy that I have suggested are an attitude of permissiveness for a variety of theoretical and empirical activities, combined with an obligation to relate these to the core of sociology. These criteria, like other optima suggested in this essay, constitute an effort to encourage the greatest specialization in the discipline but simultaneously to guarantee the continuing effort to synthesize its knowledge. Duncan, Otis Dudley, and Leo F. Schnore. 1959. "Cultural, Behavioral, and Ecological Perspectives in the Study of Social Organization." American Journal of Sociology 65:132-46. Homans, George C. 1964. "Bringing Men Back In." American Sociological Review 29:809-18. Lipset, Seymour Martin, and Neil J. Smelser. 1961. "The Setting of Sociology in he 1950s." In Sociology: The Progress of Decade, edited by Seymour Martin Lipset and Neil J. Smelser, 1-13. Englewood Cliffs, NJ: Prentice-Hall. Merton, Robert K. 1957. Social Theory and Social Structure. Rev. ed. Glencoe, IL: Free Press. Parsons, Talcott. 1937. The Structure of Social Action. New York: McGraw-Hill. ---. 1954. "The Present Position and Prospects of Systematic Theory in Sociology." In Essays in Sociological Theory, rev. ed., 212-37. Glencoe, IL: Free Press. 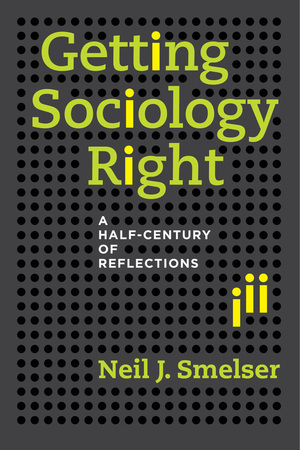 Neil J. Smelser, one of the most important and influential American sociologists, traces the discipline of sociology from 1969 to the early twenty-first century in Getting Sociology Right: A Half-Century of Reflections. 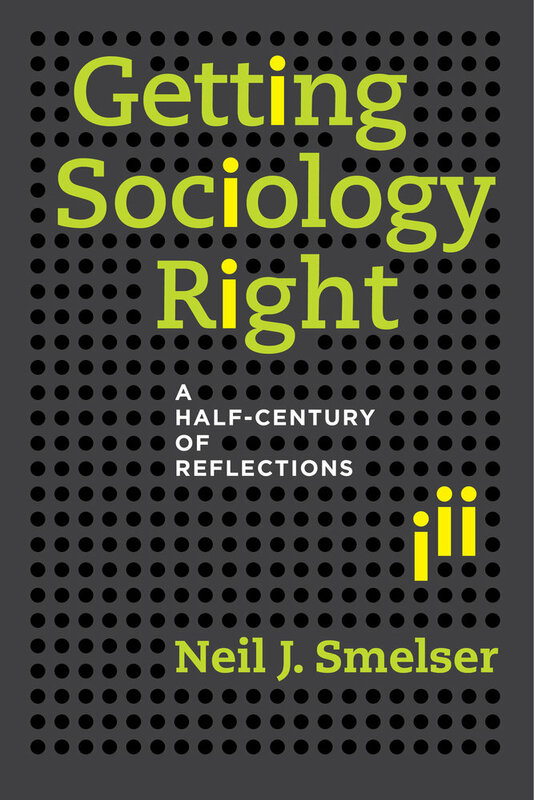 Examining sociology as a vocation and building on the work of Talcott Parsons, Smelser discusses his views on the discipline of sociology and shows how his perspective of the field evolved in the postwar era. Neil J. Smelser is Professor Emeritus of Sociology at the University of California, Berkeley. He was a Rhodes scholar at Oxford University from 1952 to 1954. At twenty-four, he coauthored Economy and Society with Talcott Parsons. He earned his PhD in sociology from Harvard in 1958 and was a junior fellow of the Society of Fellows. From 1994 to 2001, he directed the Center for Advanced Study in the Behavioral Sciences. "Smelser's reflections are important for the balanced assessment they offer of the scope and inherent tensions of the discipline, and the forces which shape it. The sociology of the twenty-first century will be better for the rescue of this wisdom. "—Lyn Spillman, University of Notre Dame.